Restore the balance in your life and feel rejuvenated! I was so excited to try these when I saw the recipe. I didn’t have kielbasa, so I used Aidells Chicken Apple Sausage. They turned out perfect! Great flavor and another one to add to the mix of party foods. Cut sausage into slices (about 1/3" thick). In a medium skillet, bring the pomegranate juice and ketchup to a boil. Boil for 2-3 minutes or until it becomes syrupy. Add the sausage slices to the sauce and cook over high heat. Turn the slices occasionally, until the mixture reduces almost completely and coats the sausage. Serve with toothpicks or with crackers. I tried these for the Super Bowl and they were delicious! I can't wait to make them again. I even stocked up on frozen wings last week when they were on sale. If you don't have a Trader Joe's near you, there are quite a few brands that have a Carolina Gold BBQ sauce that you can find at your grocery store. Put the frozen chicken wings in crockpot. Add Franks hot sauce. Stir the chicken wings in the sauce. Add Carolina Gold sauce and stir. Once they are done, remove chicken wings and place in a baking dish. Brush some Carolina Gold Sauce on them and broil until nice and crispy. Remove and brush more sauce on them and then put back in the oven for a few minutes. This one is a favorite of my youngest daughter. She requests them every time we have an event that I'm making snacks for. So I stock up on Lil Smokies whenever they are on sale and freeze them. Add all the ingredients to crockpot. Stir together and cook on low for 1 hour. I love appetizers! And I love any opportunity to make them. These meatballs are super easy and great for a crowd. I usually use grape jelly, but I have also used apple jelly, apricot jelly, and peach jelly. All turn out great. Cook for 3-4 hours on high (7-8 hours on low). I first discovered these little bites of heaven years ago at a baby shower. I mean you can't go wrong with a sandwich toasted in buttery oniony goodness! They are also great for a quick, easy dinner. 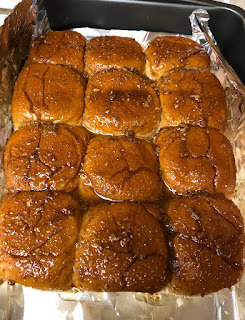 These packages of Hawaiian Rolls are often on the “soon to be expired rack” at our grocery store, so whenever I see them, I stock up to make these sandwiches. FYI, the rolls and sandwiches both freeze really well. I also use whatever lunch meat (ham or turkey) and cheese (Swiss, Colby Jack, Cheddar, American) that we have lying around. Or a combination of them. They have all turned out great! I also usually leave out the poppy seeds just because I don’t keep them on hand. Mix and match the ingredients and make these your own. It’s time for Super Bowl snacks! I love snack foods and appetizers. And when I make them, it usually means that we are having a party with family and friends! I discovered this recipe last year and made it for NYE. My first time making it, I forgot to drain the Rotel. It still tasted great, but it was pretty runny. I also hate the chunks in Rotel, so I blend it up before adding it. Serve this warm with tortilla chips. It's not pretty, but it tastes amazing! In a medium sized bowl, add corn, black beans, rotel, cream cheese, chili powder, garlic powder, cumin, cayenne, & 1/2 C shredded cheese. Stir together. I use my KitchenAid. Potatoes are my FAV! Seriously, my favorite food. I was raised on a potato farm and potatoes are in my blood. Love me a baked potato. Loaded with butter. And cheese. And bacon. And… You get the idea. But I don’t like the texture when they are cooked in the microwave and I’m not patient enough to wait for them to cook in the oven. 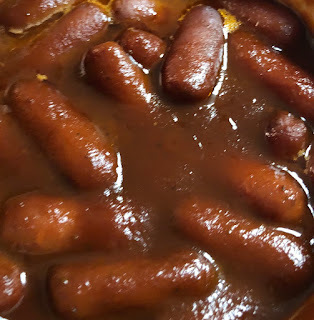 So when I found out I could cook them in the Instant Pot, I was sold! And I made them that night. To my wonderment, they were soft and fluffy. No hard spots, no cooking for an hour, and they were cooked all the way through. Finally! Potatoes (just don’t fill above the line)1 C waterInstructions Put water in Instant Pot. Add trivet. 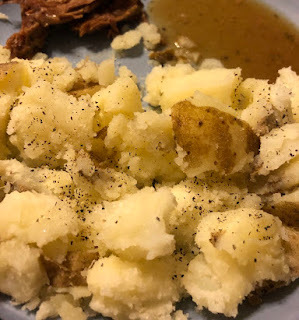 Cut potatoes into similar sizes and add to Instant Pot. Allow pressure to naturally release for 10 minutes, then do a quick release. What started as a blog for foot zoning is turning into a place for me to share more of what I love. Trying new recipes, DIY, finding amazing deals, and so much more.